CUSTOMER SERVICE 208 • SHOPPING CENTER BUSINESS • May 2018 staff members are assigned to each Private Suite visitor to guide them through the ex- perience or facilitate in-suite services such as massages and spa treatments, hair styl- ing, full meal service or even a doctor. LAX Private Suite members can receive a discount on the service at Westfield Century City. The non-member rate for Private Suite is $1,500 per day. DISRUPTING THE DISRUPTORS While its vintage red logo hasn't changed through the decades, Westfield continues to be an innovator with new services and platforms as well as redevelopments at several of its flagship properties, even as it was announced in December that Unibail-Rodamco would buy Westfield. Senior management at the Sydney-based company will retire and move into advi- sory positions following the acquisition. Westfield, which has become a premier brand that owns and operates 35 shop- ping centers in the United States and Unit- ed Kingdom valued at $34.5 billion, was To match its suite of top retailers, Westifled wanted hotel-like concierge services at its centers. To do so, it has provided concierges with tools, visibility and accessibility. 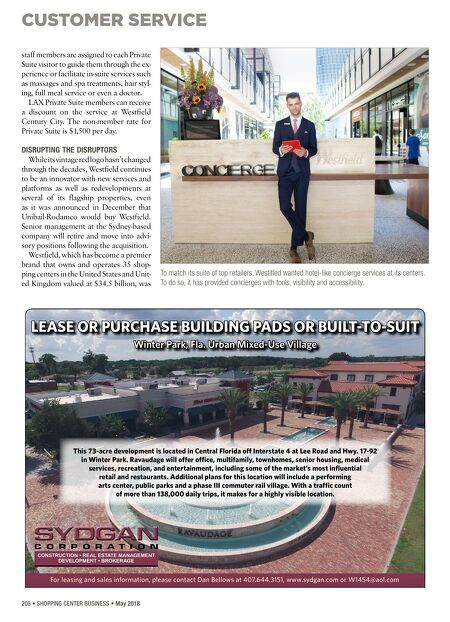 LEASE OR PURCHASE BUILDING PADS OR BUILT-TO-SUIT Winter Park, Fla. Urban Mixed-Use Village F or leasing and sales inf ormation, please c ontact D an Bello w s at 40 7 . 6 44. 315 1, www .s y dg an. c om or W1454@aol. c om This 73-acre development is located in Central Florida off Interstate 4 at Lee Road and Hwy. 17-92 in Winter Park. 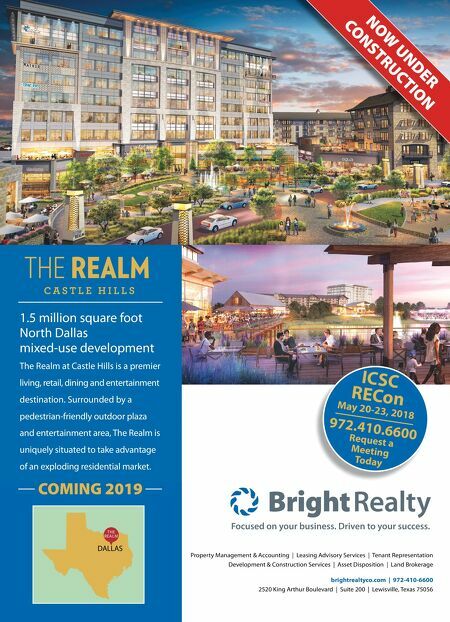 Ravaudage will offer office, multifamily, townhomes, senior housing, medical services, recreation, and entertainment, including some of the market's most influential retail and restaurants. Additional plans for this location will include a performing arts center, public parks and a phase III commuter rail village. With a traffic count of more than 138,000 daily trips, it makes for a highly visible location.